What a magical place Landoll's Castle is - our wedding was like a dream! 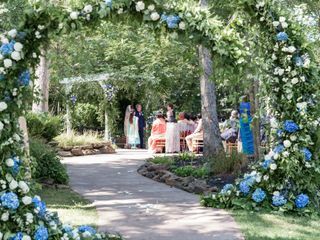 The grounds are beautifully kept and it is an ideal location for an outdoor wedding. So many enchanting & unique rooms to lodge our family & friends! Located between two major airports in Columbus & Cleveland, it was a convenient destination for many out of town guests. Many really enjoyed the country-side drive through Amish Country. The Landoll team was so incredibly accommodating and great to work with! Shayla Landoll, who was also our wedding planner, connected us with everyone we needed - from makeup artists to our floral & set designers. We literally rode away in a horse-drawn carriage (which Landoll arranged!) They also have a restaurant and their Executive Chef prepared the most delicious meal for our dinner. Many of our guests had never been to an outdoor wedding before, and several commented it was the most extraordinary experience. My only regret is that we didn't take advantage of the spa-services they offer at their magnificent pool house. I have to mention, while we were there, we also witnessed some really lovely yet simple weddings. Whatever your budget is, I saw the Landoll team make every bride feel like a Princess! It's such a captivating & beautiful place with such a great staff - and they treat all their guests like royalty! My husband & I look forward to returning to this magical place to celebrate future anniversaries! Wonderful unique venue. Shayla and her team did a superlative job handling everything from the rehearsal and dinner through the wedding and the reception! My wife and I got married there on October 6, 2018. I must say at the beginning I was concerned, because as two brides, I wasn’t sure how we would be received. Our experience was absolutely amazing! First and foremost, Shayla rocks at her job. She made us feel like family, just as the rest of the staff has. There were never any issues that she didn’t take care of immediately. Our journey was about a year and a half and she lead us through all of it! Our day was beautiful and went off without a hitch! The grounds are amazing and we’ve stayed there 5 times the past year and a half and have already booked another room for December. I would recommend Landoll’s for future brides and grooms. Shayla made us feel completely confident that she had everything under control. I loved how romantic our setting was and it was so for all of our guests. It’s such a beautiful place, but it’s not pretentious or snooty. Everyone is so nice and they have great senses of humor. 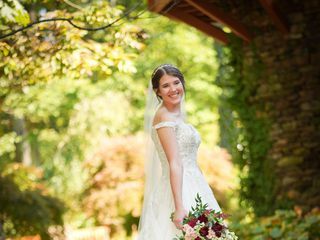 My daughter posted a rather negative review on theknot on 10/14/18 towards Landoll’s Mohican Castle and her wedding experience. I want to counter that review and assure anyone considering Landoll’s, as their destination wedding, that the experience is wonderful... much like something out of a storybook. How Landoll’s can manage multiple wedding ceremonies in a given weekend, and still make you feel that they are completely focused on your event, is amazing. Our wedding planner’s (Melody) caring efforts and individual attention allowed my daughter to have the perfect fairytale wedding she dreamed of all her life, where a princess married her prince at a beautiful castle. I recommend Melody and the Landoll team to any aspiring prince or princess on their quest to happily ever after!! 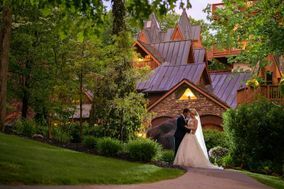 I highly recommend Landoll’s Mohican Castle for your wedding or other event! Shayla and her staff were just amazing and made my daughter’s wedding a delightful and magical celebration. The property is just an hour away from Columbus, but truly felt like a destination wedding. From vendor recommendations to local area discount programs, they were extremely resourceful. Onsite rehearsal dinner options were simple and made the day so relaxed and enjoyable for all. The staff made every effort to meet our requests throughout wedding day even providing umbrellas when the weather turned to a very calming day of showers . 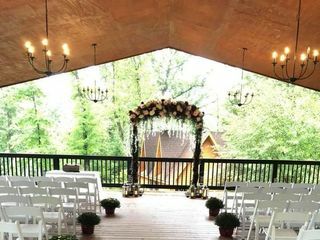 The ceremony was easily moved from the terrace to the new pavilion which was cozy for 120 guests. The event center provided an exquisite location for the reception and we were able to add our own special touches. Shayla had our favorite drinks waiting as the bridal party was introduced at the reception. Guests raved about the property, the food was above our expectations, and the atmosphere was unparalleled. Our vision came to life of the fairy tale wedding for our daughter and new son-in-law last weekend at Landoll’s Mohican Castle last weekend! 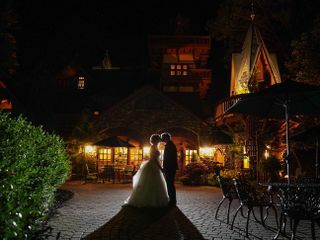 Landoll's Mohican Castle was an amazing place for our wedding! They have the sweetest and most accommodating staff (Shayla was amazing during the planning process). We had family coming from all over the country and was almost like a destination wedding. Future brides may love a few of these things that Landoll’s offered: -Flexibility with wedding packages -Multiple on-site options for the ceremony. We loved the terrace but it rained on our wedding and we moved the ceremony quickly to the pavilion, and our guests loved it even more. It was beautiful! -On-site rehearsal dinner was easy and delicious. Our guests in general loved the food. -The rooms are beautiful and our guests loved staying there! If you book this venue, you won’t regret it! Our wedding was beautiful and everything we hoped it would be. Melody was there through it all and was so nice and very helpful with everything . The good was excellent and our guest had a great time. I could not ask for anything more, it was perfect! Oh my goodness, having our wedding at Landolls Castle was a dream come true! The grounds are absolutely gorgeous. Melody, was extremely helpful and sweet through the entire process. I’m beyond happy with our experience and 10/10 recommend to anyone searching for an amazing venue! Perfect wedding; perfect vendor!! Melody is amazing. She is so kind, attentive, and helpful. She was genuinely happy for my new husband and I. She helped us every step of the way from the beginnings of wedding planning to the end of the wedding reception. She even checked on us the next day and gave us a gift and a card. I had the wedding of my dreams at this venue thanks for Melody. Absolutely amazing! Melody was fantastic and kept everything running smoothly. The grounds were beautiful and the food was so good. We had the Sunday brunch and all of our guests raved about the praline French toast. We honestly couldn't have asked for a more amazing day, it was better than I ever could've imagined it would be. Our wedding was more perfect than we could have dreamed. Melody, our coordinator, was so helpful throughout the planning process. She is such an open, genuine person and we are so thankful that she took the time to get to know us. The morning of our wedding she switched out some of the standard decorations to better match our style, without me even asking! Kyle, the chef, made special appetizers and entrees to make our wedding vegan-friendly. Each one of our guests raved about the food. 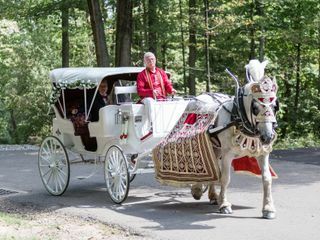 Landoll's Mohican Castle came through on all of our wedding needs - shuttle, after-hours party and beautiful guest accommodations. Our day was pure magic, and I have Melody and the staff at Landoll's to thank for that! What an awesome and memorable experience we had at Landoll's!! We only had out Rehearsal Dinner that this beautiful venue but the service they provided was exceptional. Melody was a joy to work with and she made the whole process run smoothly and helped make sure we were pleased start to finish! I cannot begin to thank the entire staff at Landoll's for everything they did for us!! If you are considering this venue for an event, vacation or wedding, we would highly recommend it! If you live in the area, go and visit and stop in to have a bite to eat! We LOVE the food there!! Thank you Landoll's for all that you did! We will be back for a visit soon!!!! The castle was an absolutely magical place to get married! Shayla and the whole staff did an amazing job making sure my fiancee and I could have the relaxed, fun wedding of our dreams. Shayla coordinated everything seamlessly with the other vendors and knows her stuff. The guests loved the beauty of the castle grounds, the delicious food and the great service throughout the reception. The whole weekend was amazing. We ended up having an after-rehearsal-dinner party in the pool house and Shayla and the staff moved everything up there for us and made sure we had everything we needed. We had lots of kids there and the staff was wonderful with them and the kids had a great time exploring the grounds and castle. We can't wait to come back for our anniversaries! we had the MOST AMAZING experience in the WORLD!! it was a true fairytale!!! the absolute most amazing day in our lives! thank you to Melody McCory for making our dream wedding come true!!! not only is she the kindest person on the planet, but she really does care about YOU and YOUR special day! just the sweetest person I met in Ohio!!!! thank you so much for this venue! I want to do it all over again and again!!! we love you guys! the castle was gorgeous (o; the castle made for the most perfect pictures ever! our wedding dinner was delish!! the ribs just fell off the bone. the bartender was so sweet and bubbly! thank you for everything, we cannot wait to come back and stay our night there in the castle! the only thing I would make sure everyone knows is the roads are dark and windee! just tell your guests to be careful or use the complimentary shuttle they have!!!! we WILL be back and we encourage everyone to use the castle for their special day!!!! Our wedding at the castle was absolutely amazing. It was truly a fairy tale! The entire staff was more than accommodating, and was on top of everything. The food was so good, and the event center was put together perfectly. Melody, the wedding planner at the castle, was so sweet, and totally knew how to plan a wedding inside and out. A lot of my guests stayed at the castle, and they loved the scenery and the rooms. This is the coolest place to have a wedding, and I can't recommend it enough! Thank you so much for this kind review. We love what we do and it is because of Brides like you! Cheers, Melody! 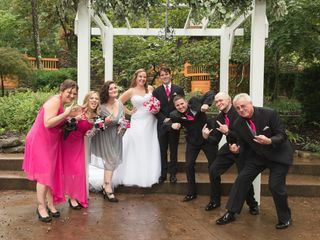 Our daughter and son in law had a magical wedding weekend at Landoll's Mohican Castle. The rehearsal cocktail reception and dinner on the Wedding Terrace on Friday evening under the twinkle lights, with the castle as a backdrop, was a beautiful start to the celebration. The Landoll wedding team, led by Melody, were a dream to work with and created a picturesque setting for the wedding ceremony and reception. Our guests raved about the food and service. Thank you Melody and Matthew for a fairytale wedding! Our wedding had less planning time than most traditional weddings. The bride wanted a unique sunset wedding and night time dinner for our small private ceremony. Between the initial discussions and the execution the night of everything went very smoothly with no serious issues or delays. The ceremony was exactly how we wanted it and met all expectations we had. It was a very gorgeous setting and the evening was perfect for photos and ambiance. We shared the Landolls suite and it was a romantic and beautiful room which we both enjoyed after our long day. There is a photo opportunity at every corner and the staff were able to meet certain request we had with lighting and the menu. They even had back up plans in place for any possible weather issues. Landolls was recommended by my parents who have stayed there before. So there are multiple occasions in which we have been pleased by their services. Thanks for everything. The castle was so beautiful and the perfect back drop to our wedding. Shayla was our wedding coordinator and was so helpful and quick to respond to emails. All of the other staff members we interacted with were also very friendly and helpful. The food was very good as well. They made everything so easy for us and we were able to relax on our wedding day knowing everything was taken care of. We truly had the best experience at Landoll's. Melody made everything so easy! As a super organized bride, having all of Melody's experience and organization made every decision simple. They were very accommodating to our dietary needs and special requests so we were able to personalize a lot. Every person involved during the planning and especially on the day of our wedding did so with professionalism and a smile. It was a wonderful experience and I would definitely host another event at Landoll's. It has taken me two months to write this review; simply because I couldn't craft the words to describe how absolutely perfect our wedding day was at Landoll's. My mom, my now husband, and I went to many, many venues before stumbling upon Landoll's, and everything just seemed so drab and beige! I wanted something with a little pizzazz. As soon as we drove onto the Landoll's property, my husband and I looked at each other and immediately knew this was it. It was just a bonus that the prices were reasonable as well. We had many planning meetings with Shayla and Melody prior to the big day. They were so accommodating and helped make an overly anxious planner bride like myself feel very at ease. When the big day finally came, I thought I would be a wreck, but it was all smooth sailing. Shayla took over! I do not have words to describe how wonderful she was on the day of. Everything was perfectly timed out, and she always made sure I had everything I needed. The castle was the perfect backdrop for my literary fairytale themed wedding, and we will definitely be coming back to stay again for our anniversary! My Husband and I were married at Landoll’s Castle 1/28/17. Our day was perfect! If you want a stress free wedding, this is the venue for you. Starting with the first phone call I placed to the castle, with inquiries about wedding services, up to the day of our ceremony we were treated like a King and Queen. All of the staff were friendly and helpful. Our venue and honeymoon suite were both very clean. Our guest LOVED the food that was survived for the reception, they gave everyone generous portions. Landoll’s castle was the most cost effective, of all the venues I priced. However, their wedding coordinators and service are worth way more! Thank you, Matthew and Shayla for all that you did to make our day perfect. This was the perfect venue for my Lord of the Rings themed wedding! The grounds are gorgeous, the pricing was reasonable, and the castle wedding planner Melody was marvelous! Melody was prompt in answering all questions and took care of all the details the day of the wedding. The recent renovations were the icing on the cake. They provide all of the food and it tasted great; better than other weddings I have been to with more expensive caterers. We had a rehearsal brunch hosted at the castle restaurant which was excellent also. I really loved my experience at Landoll's and felt that they were a huge part of making my wedding everything I dreamed! The castle made our wedding a wonderful experience! And the pricing was very doable. No need to worry about any details. They set it all up and the food! The food was amazing!! Being a castle we themed our wedding with the Hobbit and it was a match made in heaven. The scenery was breathtaking. The event coordinator, she is the sweetest and most helpful coordinator I have ever met. We highly recommend this venue! Come and have your wedding here, I promise you, you are going to love it. 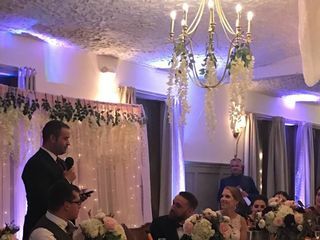 From start to finish we were completely satisfied with the service and experience of having our wedding at the castle. We had the pleasure of working with Melody throughout the entire planning process. She was professional and attentive to all of the details and very quick to respond to all of our questions. On the day of our wedding, our guests continually complimented the quality of the food and the venue in general. We would recommend Landoll's Mohican Castle to everyone! We plan to come back and stay for our anniversary.